Looking to watch the Cleveland Indians season opener in New York City? We’ve got you covered! Baseball is back! Join the Big Apple Browns Backers for our Indians’ watch party Thursday, March 28th at 4pm vs the Minnesota Twins — hosted at Brother Jimmy’s Murray Hill, our official location and the BEST Cleveland sports bar in New York City. 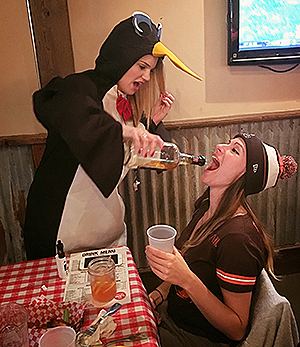 Once you’ve arrived, just head down the steps to the basement level where you’ll enter our Cleveland safe-haven, with over 12 giant TVs & 2 massive projectors, a full bar, dedicated waitresses, lots of beers on tap and great BBQ and drink specials. Follow us on Facebook, Instagram and Twitter. We won’t spam you with nonsense, but it’s the best way to stay informed about watch-party announcements and the occasional dank meme or Cleveland related rant. For those interested, you can officially join our chapter. It takes 5 mins, is 100% free and helps us gain recognition from the Browns Backers Worldwide organization.